A pastor decides to 'live as an atheist' for one year in the attempt to sort out anguishing questions. Dr. Craig has plenty to say about this methodology! "I will live as if there is no God. I will not pray, read the Bible for inspiration . . . I will do whatever I can to enter the world of atheism and live, for a year, as an atheist. It's important to make the distinction that I am not an atheist. At least not yet. I am not sure what I am. That's part of what this year is about." Christian Apologetic Movie Outreach - "God's NOT Dead"
Would you take your atheists friends to go see a high-quality Christian movie, with well known actors, in which the focus is a college student engaging in an intelligent, philosophical debate with his Philosophy professor concerning the existence of GOD? Yeah, I thought you would. On March 21, 2014 you will have just such an opportunity. I encourage you all to get your churches involved and to log onto the official movie site HERE and to bring this movie to your city, or go to a nearby showing as an apologetic/evangelistic outreach in your community. New Discovery!! - Spider that designs a DECOY of itself, to fool predators! 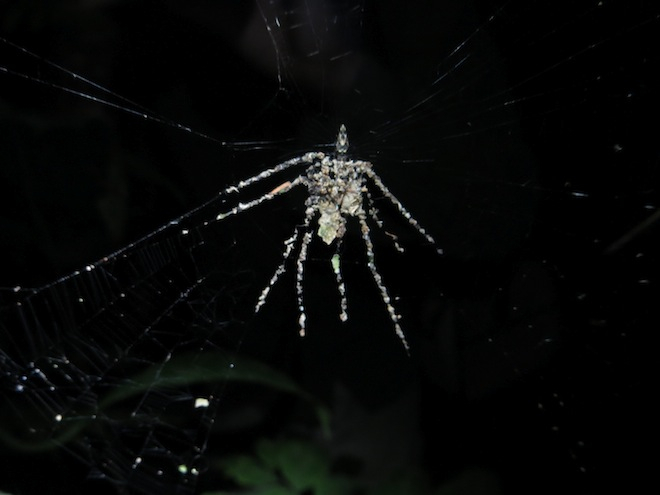 A spider that designs elaborate, fake spiders and hangs them in its web has been discovered in the Peruvian Amazon. Scientists suspect the fake spiders serve as decoys, part of a defense mechanism meant to confuse or distract predators. It sure seems like this is an example of Intelligent Design in nature, engineered by a creature that is itself an example of Intelligent Design - the spider. I wonder who taught this spider to create this geometric imitation of a spider? Who instructed the spider that it's design would work (psychologically) into fool predators into attacking it? If we can detect that this "decoy" is an instance of Intelligent Design, why can we not make the same inference with DNA, the Human Cell, or humans in general? Using the argument from "the Lesser to the Greater", if the lesser must be designed (the decoy) must not also the spider that constructed it? For the full article, go here on "Evolution News", our fantastic ID friends. Where Does the Evidence for Intelligent Design Lead Us? "Once you eliminate the impossible, whatever remains (no matter how unlikely), must be the truth." We have seen that this is indeed the case for the scientific theory of Intelligent Design. After examining the evidences of Astronomy, Physics, Biological Machines, and the Genetic Code of information of DNA....what are the implications of our search? Is Naturalism a self-defeating idea to hold onto? Is it possible that Naturalism is insufficient as a perspective on reality in the areas of science, philosophy, and liveability? As we discuss in this episode of "Intelligent Faith Radio" the worldview of Naturalism is fraught with intellectual problems and contradictions, and is a completely bankrupt and inconsistent view of reality. Be sure to take note of the 5 ways in which Naturalism fails, and use it in your conversations and discussions about the Christian worldview. For more evidences, be sure to download to "Intelligent Faith Radio" podcast from iTunes as well. What do you think the main reasons that many young people become atheists? Atheists Say That Richard Dawkins is an Embarrassment! Contrary to common opinion, Richard Dawkins (ex-professor of Biology of Oxford University), has become the laughing stock of the atheistic intellectual community. > Does the perspective of Naturalism have any intellectual problems within it? > Are there any contradictory ideas from Philosophy, Science, or from Logic that oppose Naturalism? > Is Naturalism a bankrupt and impotent idea, intellectually?